Three Bad Mice: Tickets Please! 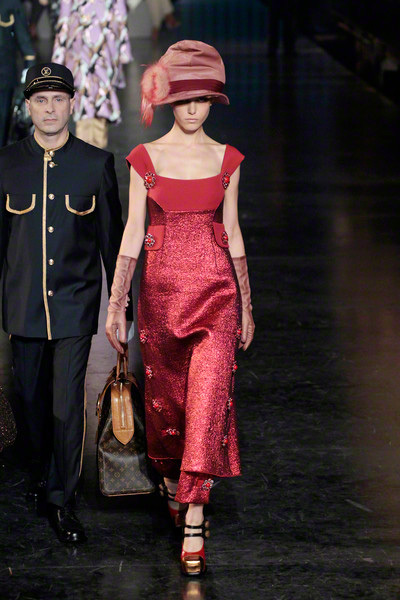 All Aboard the Louis Vuitton Express. Tickets Please! All Aboard the Louis Vuitton Express. 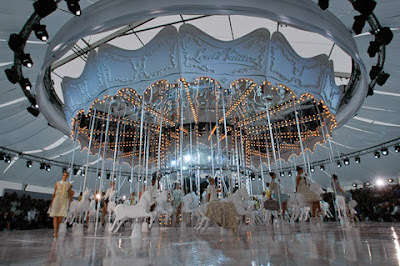 Back in September the shiny, white Louis Vuitton carousel whirled models clad in surgared almond and sorbet hues around the catwalk during Paris Fashion Week. There was much hype and speculation at the time about what the carousel meant. Was this meant to reflect the never-ending merry-go-round of fashion? Was it supposed to symbolise the fact that Marc Jacobs' ride at Louis Vuitton was over and that he was off to Dior? 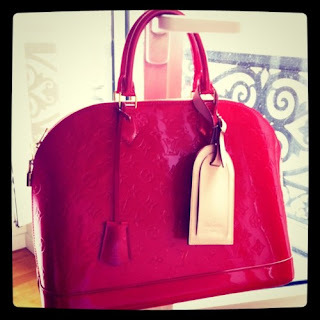 Or was it really nothing other than an ostentatious display that only a Vuitton sized budget could pull off? A bit of fashion frippery to lift the spirits of a gloomy, grey, recession-sodden world? 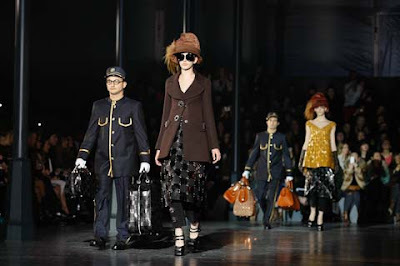 Marc Jacobs is still very much at the LV helm and whatever the carousel symbolised, we have been looking forward to this Paris highlight from the moment that NYFW kicked off almost a month ago. Well, let's be honest, it started long before that. We were thoroughly overexcited when back in October photos started popping up on blogs and Twitter of the LV show invitations which took the form of a cream leather luggage tag with the show details under the monogrammed flap. Speculation started afresh, this time as to the a/w 12 show theme. Our guess was something aeroplane related. We were thinking jetset glam: Marilyn Monroe and Jackie O waving in chic suits from the top of a flight of stairs leading from private jet to runway tarmac perhaps with a bit of Pan Am thrown in for good measure. 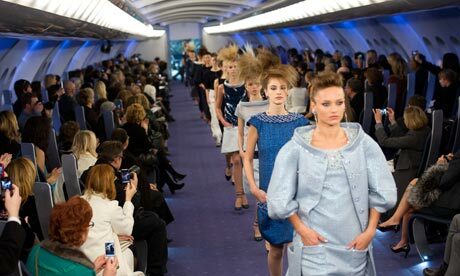 But then another Paris stalwart, Karl Lagerfield showed Chanel's s/s 12 Couture collection in January in a Chanel branded plane complete with airline seating and champagne served from a trolley. LV clearly weren't going the aviation theme route, so it was back to the drawing board for our sleuthing. What could that luggage tag mean? Well, at 10am Paris time yesterday morning, the wait was finally over. The show was live-streamed on the Louis Vuitton website so, as my work day was drawing to a close in Hong Kong, I plugged my earphones into my laptop and transformed my desk into a front row seat in the huge marquee in the courtyard of the Louvre, the setting of the Louis Vuitton a/w12 show. It was all very, very dark but I could just about make out a glossy black runway flanked by cast iron archways suspending a glowing moon-like clock face just in front of a black curtained entrance. Part Gare du Nord, part Platform 9 3/4... We were clearly in a railway station. As the clock began to strike ten, the curtains drew back to reveal billowing clouds of steam, a whistle blew, the glossy catwalk split and slid apart to reveal a set of tracks and a slow chugging could be heard drawing closer and closer. 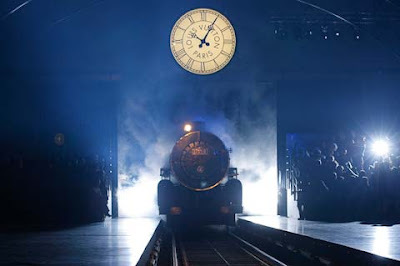 And then out of the steam emerged a huge, navy and gold steam engine pulling a carriage with 'Louis Vuitton' emblazoned down the sides, the silhouettes of passengers visible through the windows. A couple of metres from the end of the catwalk, the engine drew to a stop, a navy and gold liveried attendant hopped out and the train's passengers began to disembark. 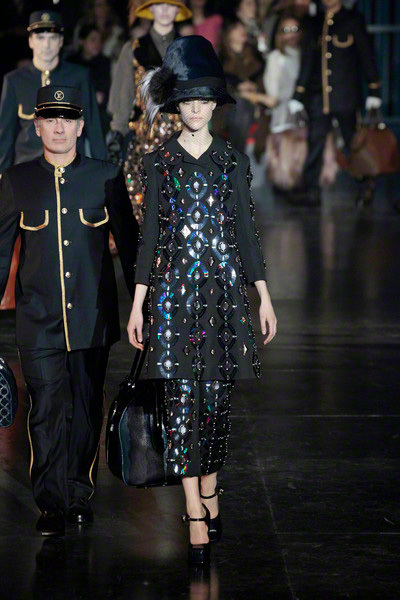 Those passengers were of course the forty seven models who stepped off of the LV Express to stalk down the platform in the Louis Vuitton a/w 12 collection. A few steps behind each model followed a uniformed, white-gloved porter laden down with luggage. Hatboxes, valises, over-sized totes, overnight bags, in every colour, in every exotic skin and hide, some sequinned, some monogrammed and some adorned with buttons. With each porter toting up to three bags, the luggage being whisked past the noses of the front row really seemed the star of the show. For a label whose name was made in luggage this seemed a very fitting tribute. There is no doubt that this was a truly spectacular piece of opulent theatre. But did the clothes measure up? 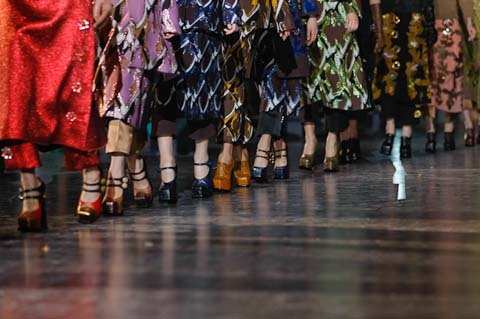 The collection was sumptuous and luxurious but still managed to be fresh and whimsical. 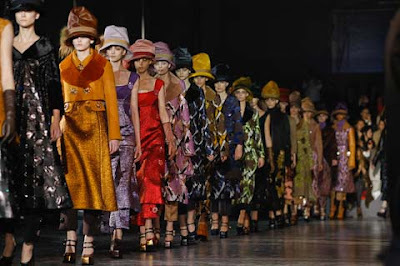 Perched atop towering platform heels, the models strode elegantly beside the diminutive porters, their height accentuated further by squashed, beribboned Stephen Jones hats (which echoed the hats Marc Jacobs accessorized his eponymous line with in New York last month). Muted neutrals and camels were mixed with rich, jewel tones. Coats with wide, velvet lapels and saucer-sized, gem-encrusted buttons were layered over cropped silk brocade trousers. A sweeping, silvery, sequinned evening gown was cloaked by a black floor-lengthed, ostrich skin coat. There was something very bedtime story about the the collection, a little Railway Children, with a sprinkling of sparkly, butterfly wing mixed in with Charlie and the Chocolate Factory. In an interview post-show, Marc Jacobs explained that he was interested in things "looking like they were from another time". And it was this that struck us most about the collection. There was another era-ness to the clothes, but which era exactly, it was hard to pin down. There was a turn of the century Edwardian feel but with flashes of the trippy seventies and elements of the prim, buttoned-up forties. The sum of all these parts was something that harked back nostalgically to a time when travel was something to dress for; a golden era of glamour and hat boxes; a time when getting to where you were going was as much of an adventure as arriving at your destination. 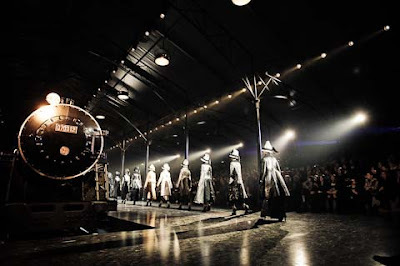 It was a magical end to Paris Fashion Week which brings to a close all the major fashion weeks. After back to back shows over the last month, this was the perfect pick-me-up for the weary, jaded fashion pack. 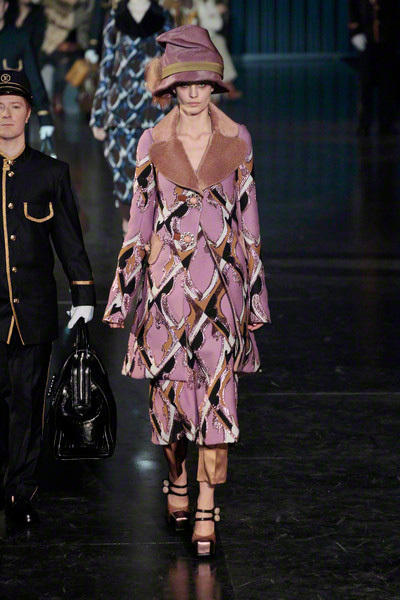 And just as the frothy, pastel pieces presented to us from a carousel last autumn have largely shaped our spring wardrobes, we can be pretty certain that the a/w Louis Vuitton collection will have a strong influence on us when the leaves start to fall later this year. Well we're definitely coveting a green, ostrich skin, hatbox anyway.